Image: Pickets at WWL NHS this summer, where backdoor privatisation plans were halted. Credit: @Unite_NorthWest. NHS trusts in England are setting up wholly owned subsidiaries (WOSs) in a bid to avoid tax. And the dangers inherent in are becoming increasingly apparent in terms of threats to patient services and jobs. Worryingly there are about 40 of these entities announced or already up-and-running in England’s NHS – for estates staff (from management to electricians) as well as porters, cleaners and other key support staff. Many out-patient pharmacies in hospitals have gone the same way. But there are signs the tide is finally turning. Tees Esk and Wear Valley NHS Trust has just announced it has ditched its plans to create a wholly owned subsidiary. This follows NHS trusts - Leicester, Mid York, Leeds and North Bristol - where trust managements have retreated from proposals to create these private limited companies. In each case, local campaigns brought together staff and the community. Their rallying cry? That the NHS means an NHS for all - and calling out wholly owned subsidiaries for what they are, backdoor NHS privatisation masquerading as an exercise in financial efficiency. Unite is concerned that the trusts are forming these entities so that they can register for VAT exemption and compete on a level-playing field with commercial competitors. Private firms can register for VAT exemption for their work in the NHS, when NHS trusts can’t. Unite, which has 100,000 members in the health service, wants HMRC to close this loophole, but the request has so far been rebuffed by the Treasury. This summer, the Department of Health and Social Care took steps to ensure that if an NHS trust or foundation trust wants to set up a wholly owned subsidiary they will have to get approval from the Department of Health via NHS Improvement (NHSi), and report their interest in setting up the company to NHSi. The main purpose of this is to ensure that an NHS trust does not place itself at financial risk by setting up a wholly owned subsidiary. Unite welcomes this statement, but believes the government should go further. Unite wrote earlier this year to the former health and social care secretary Jeremy Hunt calling for an immediate moratorium on further private limited companies being established by NHS trusts in England. At the time, Hunt failed to address these concerns – we hope for a more positive response from his successor, Matt Hancock. We believe WOSs could be creating a Pandora’s Box of dozens of Carillion-type meltdowns among NHS trusts in England, which would have a detrimental effect on key health services and the employees that provide these services. Unite members in East Kent (24-28 September) and York (27-29 September) will be taking industrial action, as a last resort in their campaign to stop their outsourcing to a private limited company, a WOS. Our members want to defend their NHS status, and to halt privatisation of vital NHS services. 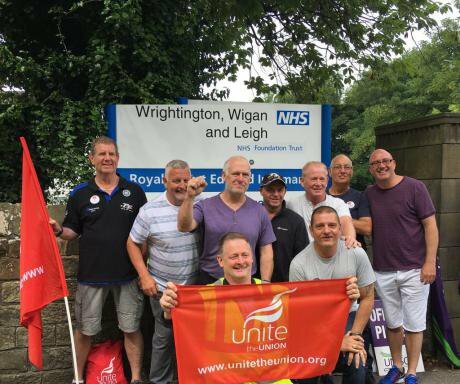 They will be building on the efforts of workers at Wrightington, Wigan and Leigh NHS Foundation Trust, where outsourcing to a wholly owned subsidiary culminated in strike action in July. This action ended in success when a solution was found and staff were not transferred to the WOS. Again, protests involving the local council, MPs and the community contributed to this heartening victory. Electricians, plumbers, fitters, porters and cleaners carry out a crucial role in keeping hospitals open and properly functioning. They are a core part of the NHS’ family’ and their jobs should not be hived off. Unite is not prepared to allow the jobs of our members to be sold off, which would inevitably lead to job cuts and attacks on the terms and conditions further down the line. And it would be fool’s gold anyway, if the HMRC eventually closes the tax loophole. Though NHS Providers promote the creation of WOSs, they are not the answer to the last eight years of chronic underfunding of the NHS and the parlous finances of many NHS trusts in England. There is strong evidence where wholly owned subsidiaries have been set up that once staff are transferred to the private limited company, new employees are not given access to the NHS pension scheme and are offered inferior Agenda for Change terms and conditions. This is where these companies seek to make savings, by short changing hard working staff under the rubric of becoming more ‘commercial’ and ‘sustainable’ (NHS companies – An enterprising approach to health, Grant Thornton, 2017). Our members in East Kent and York hospitals are at the forefront of a much wider policy struggle over the future direction of the NHS and the disaster of the 2012 Health and Social Care Act which has created a privatised, fragmented health system even health leaders don’t understand and cannot navigate. Unite says we must call time on wholly owned subsidiaries specifically and NHS privatisation generally. The NHS means the NHS.